Deokyu Mountain is one of the most renowned mountains in Korea and intersects the Southeastern and Southwestern parts in Korea while having its highest peak, 'Hyangjeokbong', which is 1,614m above sea level, and ranging from the windless Mt. Sambong (1,254m), Mt. Suryeongbong (933m), Mt.Daebong(1,300m),Mt.Deokyupyeongjeon(11,480m), Mt. Jungbong (1,594m), Mt. Muryong (1,492m), Mt. Satgatbong (1,410m) to Mt. 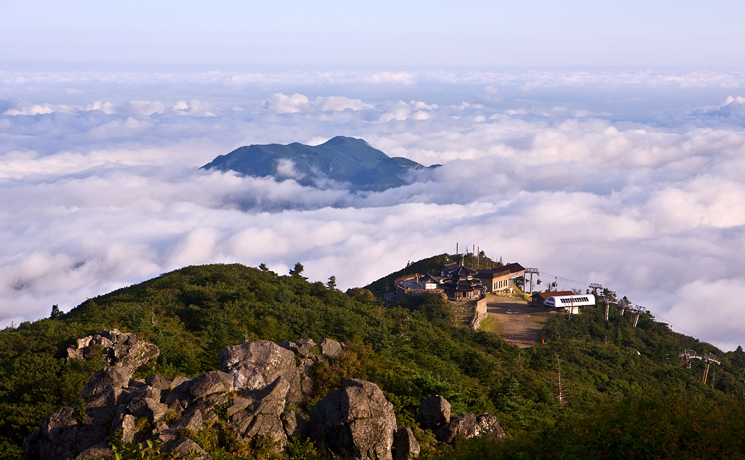 Nam-Deokyu (1,508) When going up to the highest peak, 'Hyangjeokbong', of the consecutive peaks of Deokyu Mountain overlooking the three southern provinces, you can overlook Jeoksang Mountain in near sight, but see Mt. Hwangak and Mt. Gyeryong in far sight, and Mt.Unjang and Mt.Daedun on Deokyu Mountain the West, Mt. Nam-Deokyu in near sight and Mt. Jiri andMt. Banya in far sight on the South and Mt. Kaya and Mt. Kum-o on the East. While the water, which is originated from the top of Hyangjeokbong, flows down, the 33 scenic spots of Gucheondong come to their lives. To welcome the visitors, Mt. 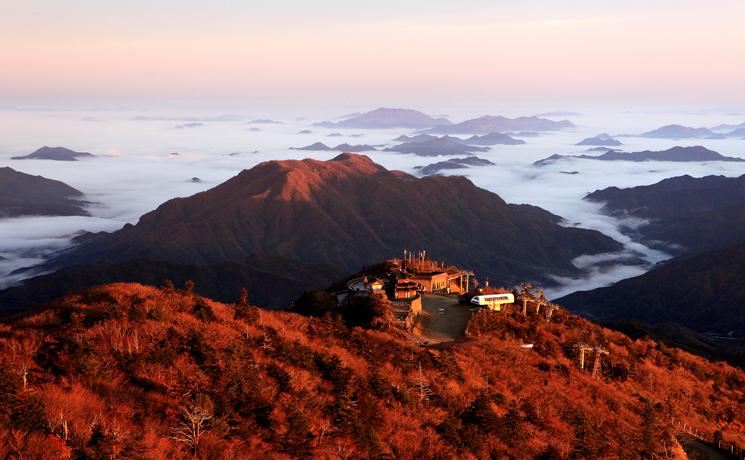 Deokyu, - which embraces Muju Resort on the North slope and Chilyeon Valley on the Western-South slope as well as stretches its limbs to some high peaks, such as Mt. Dumun (1,051m above sea level), Chil Peak (1,305m) and Geochil Peak (1,178m) and so forth, - completes its mysterious scenary while the royal azalea trees covering the valley, stretching 25kms or so, bloom the full red blossoms in spring, the deep blue shade of trees in summer, attracts the vacationers, all the mounts are ablaze with autumnal tints in fall and, in winter, the snow flowers blooming all over the milky snow-covered mounts. Mt. Deokyu, which exhibits its abundant shape during all the four seasons, gives the mountaineers big emotional touches while going up the mountain in a snowstorm having blown away with the winds at the same time when the snow-covered Korean firs and yew trees present the snowy world in winter as well as a colony of royal azalea trees in spring, valleys in summer and the glorious tints of autumn foliage in fall. Mt. Deokyu is a place to see the snow flowers blossomed on the trees even when it does not snow at all. The snowy scenary around the Hyangjeok Peak in Deokyu Mountain in an early morning of winter, which is spread white layer on layer along the ridge of 'Sanggodae' and Mt. Deokyu, presents a marvelous spectacle. Due to this, a snowy tunnel is made through the trail to go up to the top of Hyangjeok Peak, which is the main peak of Deokyu mountain. 'Sanggodae' is also called 'Su-Sang' or 'Tree Frost'. When the moisty air blown from the West Sea comes up in the sky to be clouds and then meets the dry and cold strong winds at Mt. Deokyu, it sticks to the trees and gets frozen right away. This is called 'Sanggodae' to distinguish it from the snow flowers on the trees. There are some live crystallized elements in Sanggodae, which looks like a thick frost layer, other than the simple snow flowers. When it is closely observed, it shows a structure, which is much more delicate than a snow flake. 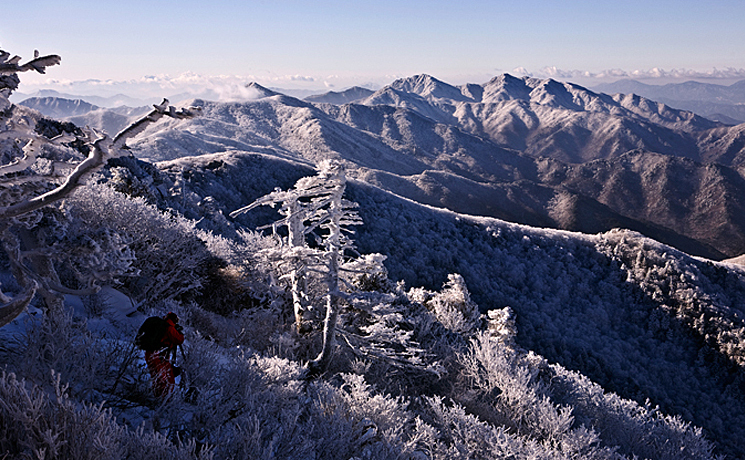 'Sanggodae' (Tree Frost) is formed against the winds on the Deokyu mountain. The frost grows toward the north when the north wind blows while toward the south when the south wind blows. When the mercury drops to one less than 10℃ below Zero, it grows well, and it is easy to be formed on the trees early in the morning or on the side of the object receiving the wind over the ground. Another inspiration, which Mt. Deokyu presents, is the power of time, which has been accumulatively built up. A numerous number of dead trees, which is met while going up to the Hyangjeok Peak, proves the time, which has passed by, by itself. The dead trees, which are left as beautiful dead bodies after having finished their precious lives, extend their life spans on the ground by meeting Sanggodae (Tree Frost). Sanggodae, which lays down in white on the dead trees, abolishes the boundary between life and death. The winter scenary, which is observed in Mt. Deokyu, is really magnificent by itself. While being immerged into its magnificence, the world left behind disappears in the observer's memory and only Mt. Deokyu itself is fully imaged in his/her mind. The winter of Mt. Deokyu starts from the dead trees, snow flowers and sanggodae and ends its life together with them. Mt. Deokyu, which is centered on the main peak, Hyangjeokbong, (1,614m) stretches its limbs around 30kms far to the southern west direction along with the grave ridge 1,300m above sea level. It is a huge mountain having its 20kms long lengthy main ridge covering from Mt. Buk-Deokyu to Mt. Nam-Deokyu (1,507m) via Mt. Muryong (1,491m) and Satgat Peak. Due to the indescribably clean and cool valleys, the exciting ridges, the ideal beauty of a soiled mountain and the broad mountain foot and height not easy to hike, the traces of the mountaineers' footsteps does not cease all around year. Since there are some colonies of yew trees, royal azalea trees and day lilies on the top of the mountain, a hiking in spring or fall is graceful by itself. Mt. Deokyu is very famous for the beautiful flowers of royal azalea trees. Especially, since lots of royal azalea trees are colonized here and there around the ridge of the mountain, there is a hearsay, 'In spring, the sun rises from the flower bed of royal azalea trees and falls down there.' The colonies are widely spread as if the whole area of the mountain were the field with the royal azalea trees. 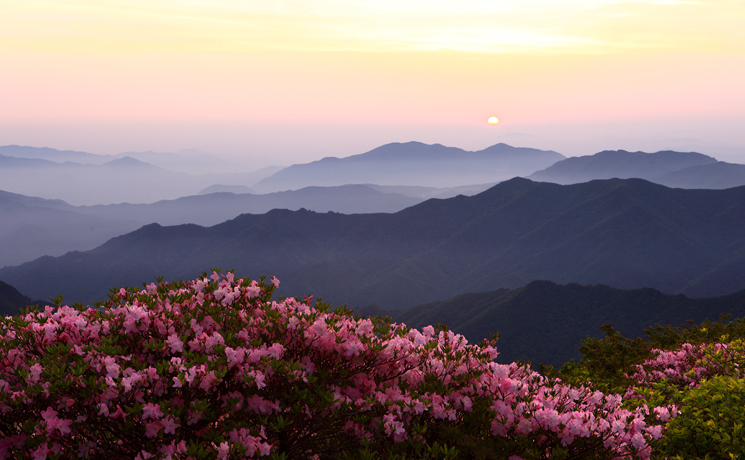 The colonies of royal azalea trees range around 20kms long hiking trail from the Hyangjeok Peak, the main peak of Mt. Buk-Deokyu, to the Yuksipryeong ridge of Mt. Nam-Deokyu. The most gorgeous place is Deokyupyeongjeon, which is made up of the colonies of royal azalea trees like a wide flower bed along the flat ridge. Usually, the period, around from May 25 to June 5, is the peak season for the royal azalea flowers. Copyright (c) 2012 MUJU Tourism Conference. All Right Reserved.